U. City has always been a melting pot of artistic talent, and local artist Cbabi Bayoc is helping students put that to the test. 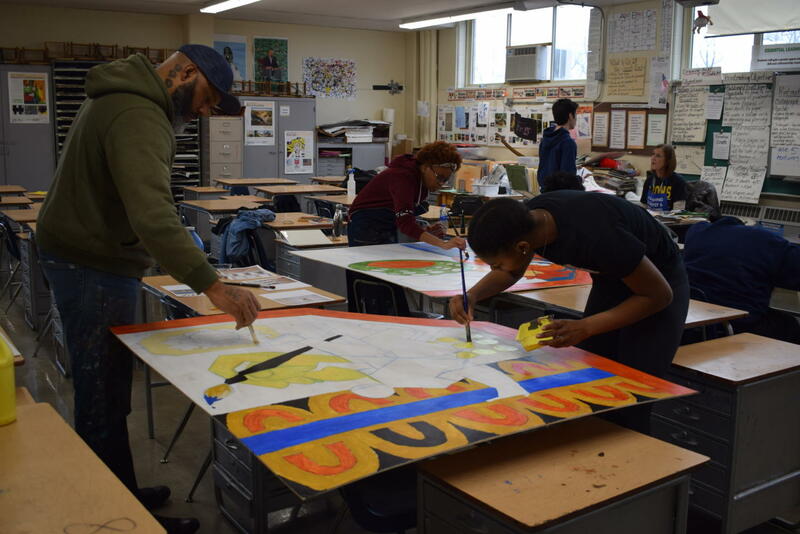 The 46-year-old spent portions of January helping students create a new mural to display in the main hallway of the school. Along with Bayoc, students began working on Jan. 18, and hoped to have it done within a few weeks. The students designed the mural to represent the fine arts of the school. They shared their ideas with Bayoc, and sketched them out with the Pre AP studio and Drawing classes. “[Ms. Claunch] reached out to me and asked me to work with her higher level art students,” Bayoc said. The O’Fallon native began his artistic career drawing caricatures at Six Flags, but now creates more influential art pieces involving race, and specifically growing up African American in the U.S. Bayoc attended Grambling State University, an HBCU in Louisiana, and after graduating, moved back to the Show-Me State. “I’ve been in South St. Louis since 1996, ever since I came back from Grambling,” Bayoc said. He enjoys working with the students and understands their potential as artists. Marnie Claunch, veteran art teacher of 23 years, is overseeing the mural project, and invited Bayoc to join them. “We were awarded a grant to make the mural,” Claunch said. From there, she set out to find the right artist to bring in for assistance. Claunch felt it was important to bring in someone who could serve as a role model for the students. As a successful and independent African American who is a proud husband and father, Bayoc battles ignorance and racism through art. He is exactly what Claunch wanted. “For the kids, seeing him and how he works has really helped,” Claunch said. As one can expect, planning the mural wasn’t easy. It required focus and creativity, while also demanding the students time. Bayoc is excited for the final product and wants to help students all the way through the construction of the mural. “I’ll be back a couple more times to see how the progress is going,” Bayoc said. The mural will be hung above the main office, with the shape representing the main auditorium stage.